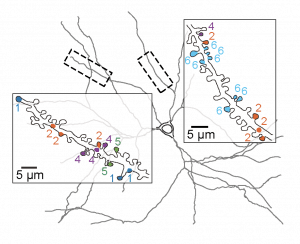 Benjamin Scholl, Ph.D. and Dan Wilson, researchers in the Fitzpatrick lab, have been studying the spatial arrangement of synaptic inputs onto dendrites and how this arrangement impacts computations in visual cortex. Previous work by Wilson et al. (2015) revealed that orientation selectivity and functional clustering of synaptic inputs in visual cortical neurons correlates with localized dendritic events, sharpening somatic tuning. In their recent paper, published in Neuron on November 2nd, Scholl and Wilson examined whether this clustering exists at a finer scale and across the diversity of functional inputs cortical cells receive. Local order within global disorder: synaptic architecture of visual space. Neuron, November 02 2017, Advance online publication.